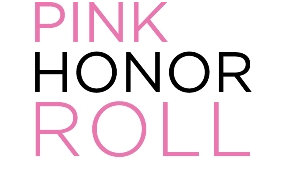 THE PINK HONOR ROLL recognizes the top individual fundraisers raising $1,000+ at each race. Members of the Pink Honor Roll receive special incentives, including invitations to selected Affiliate events, free entry into the following year’s race and recognition as a member of this prestigious group. Additionally, as a Pink Honor Roll inductee, your name will be placed on our website and your name will be included on a banner at the Komen Virginia Blue Ridge Race for the Cure.